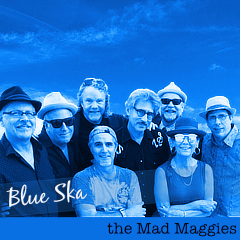 …the Mad Maggies’ music…it’s funky, it’s fun and it sounds like it’s played by people with smiles on their faces. → Folkworld reviews of Skull & Magpies (Deutsch) and Shake Those Bones (English) in their #49 issue. Academy award winning director, Paul Haggis chose “Sleepy Maggie” from “Crazed and Enthused” to underscore a 3 minute scene in “The Black Donnellys” pilot which aired on NBC & HDNet. — Rod De Witt, Andersen Valley Brewing Co.
“The Best Band Ever” — Howard Dillon, Bolinas Hearsay News.